Concrete is extremely durable, reliable, and fairly affordable, depending on the application that you are using it for. This is why more and more homeowners are opting to take advantage of this building material to create walkways, decks, and driveways. With that being said, what a lot of homeowners don’t know is that concrete can actually be stenciled. In fact, most homeowners don’t even know what stenciling is. Stenciling concrete is just simply an inexpensive way to add a little bit of style and flare to your concrete. Stenciling is a process that can be performed as your concrete is being freshly poured or it can be performed on an already existing concrete slab. Below, you will learn more about stenciled concrete. Stenciling can be an excellent way to decorate your current or new concrete slab, but the process also comes along with a variety of other benefits as well. For instance, the whole process is extremely easy for a beginner or novice to accomplish successfully. Just about any beginner can stencil his or her own concrete and it will look like it was done by a pro. Another major benefit is that the stencils are actually disposable. So, if you are hiring a contractor to stencil your concrete he or she doesn’t have to run out and purchase a new set of expensive tools to create the pattern that you are looking for. While there is a wide range of different patterns, the contractor can simply purchase a roll of stencil for the desired pattern that you are looking for. This can greatly reduce the overall cost of your job, even if you are aiming for one of the most intricate and advanced stenciling designs. Stencils are also extremely versatile when it comes to the type of concrete that they are compatible with. In fact, stenciled joints are not actually inserted or pushed down into the slab, so the shape and size of aggregate in the concrete won’t make a difference. This basically means that stencils will work with any type of concrete. Stenciling is actually a process that doesn’t take a lot of manpower and isn’t very consuming. If you are hiring a contractor this can play in your favor, because the extra labor charges won’t be so extensive. All of the work can be done from outside the forms with long handled tools, so the crew doesn’t have to wait for certain areas to dry or harden before moving onto to other areas. Another major benefit of stenciling is that the joint indentions aren’t that deep. If you are familiar with stamping or have seen a stamped concrete job, you probably already know that the joint indentions are fairly deep. However, don’t let their detour your from stenciling, because the effects still give off a very realistic appearance. In addition to this, snow can be easier to remove, because you don’t have to worry about it getting trapped in the deep indentions. When it comes to concrete stenciling, prices will vary from one contractor to another, depending on the cost of labor and materials. The best way to determine how much a concrete stenciling project will cost is to request a quote from a contractor who provides the service in your area. However, it will be in your best interest to request quotes from at least three local contractors. Most contractors offer free quotes, so there should be no extra cost for the service. Once you receive the quotes, you can make a price comparison to see which contractor is offering you the best deal. It is important to note that the lowest price offer is not always the best option. This is why you should follow up with extensive research on each contractor on your list. Focus on customer testimonials, comments and reviews, because these are a wealth of information. People who previously or recently hired the contractor will have first-hand experience and can provide other consumers with truthful information. Brick patterns, family crests, and rock styled stenciling can really take your existing concrete and bring it to life. In fact, you might be surprised to learn that the use of stencils was one of the earliest methods for decorating concrete. However, over the years the processes for stenciling has been fine-tuned and adapt to modern applications. With all the new machinery and technology available today there are now three distinct methods in which existing concrete can be stenciled. Sandblasting is without a doubt one of the oldest methods, and it basically just involves removing the top surface of cured concrete that is not covered in the stencil design. This method actually creates a raised effect in the concrete, which gives off a real neat effect. This technique is without a doubt one of a kind and is mostly used for high-end decorative concrete applications. These designs can be anywhere from contemporary to modem. However, sandblasting is a very elaborate process, which is making is extremely expensive and a dying art. In fact, most of time you will only see this type of work in smaller areas, rather than covering an entire floor. Overlayment is a completely different style of stenciling when compared to sandblasting. In fact, this method is often times used to restore worn or discolored concrete. The process works by placing a stenciling design over your existing concrete, which is then later sprayed with a different color than your existing concrete finish. When all said and done, this can create a unique, fresh-looking pattern that is extremely tough and durable. Brick patterns, cobbles, stones, and cobblestones are extremely popular for this style of stenciling. When it comes to beautifying your walkway or patio with decorative design, you will need to choose from stenciled concrete and stamped concrete. Both of the processes are extremely affordable. In fact, when compared to genuine stones, pavers and bricks, the price is sustainably lower. 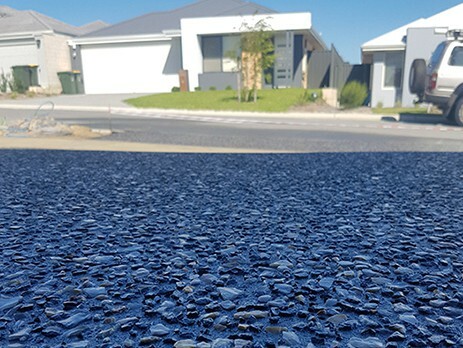 This is why many people will turn to concrete stamping and stenciling to improve the appearance of their new and existing concrete walkways, driveways, garages and patios. Choosing from concrete stamping and concrete stenciling can be difficult, since both processes are so affordable. However, the time these processes are approached is entirely different. For instance, concrete stamping is only an option for individuals who are installing a new concrete walkway, driveway or patio. This process involves adding dye to concrete during the mixing process and before it is poured onto the foundation. After stamping, the residual release agents must be removed and a curing compound added. After this is complete, you will just need to complete the concrete installation, which involves installing joints and adding a sealer. Concrete stenciling is completed before and after the concrete sets. 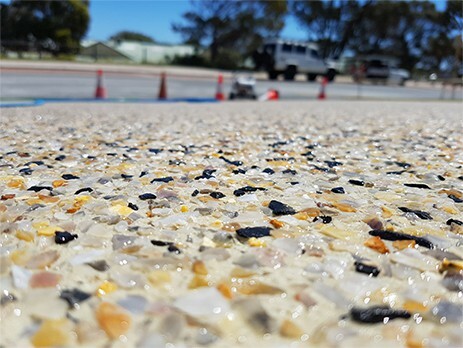 In some cases, individuals will choose to approach the process after the concrete has been poured, screed, floated and edged. However, the process can be completed after the concrete sets, depending on your situation. The stencils are made from paper, so they are fragile, but extremely easy to work with. A large area of the concrete can be stenciled at the same time to ensure a speedy finish. Stenciled concrete can also be utilized indoors. Whereas, stamped concrete is only for outdoor applications.